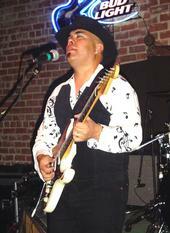 Like so many guitarists, Tucson's Rey Vasquez got real serious about guitar when he discovered Stevie Ray Vaughan. He'd already been playing the guitar awhile, and had his first electric at age 8. Then one night, a few years later, Rey's dad rousted him out of bed to check out SRV on Saturday Night Live. At that point, Rey got focused on his playing, acquired a Strat and really dove into the Blues. Similar to our other Strat-o-brother, Todd Tijerina, Rey spent some of the 90's in Chicago, frequently participating in the weekly jams at Buddy Guy's Legends club. 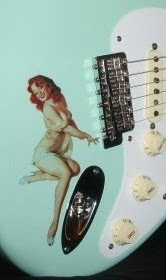 "...My main Strat is "Kid Leche", a 1990 Mexican Strat with various mods to it including Fender Texas Special pick-ups, custom shop electronics, and various other cosmetic stuff. .. I currently run a Fender Hot Rod Deville that has been "hot-rodded" even more by a local amp tech. Depending on the venue, I'll run another Deville or a 4x10 tweed extension cab. My effects run as follows: Boss DS-1, Ibanez Tube Screamer (both modded by Analog Man), Voodoo Labs Sparkledrive, Tremolo, Analog Chorus, and Micro Vibe; Boss DD-3 (modded by Analog Man), and a Boss TU-2. I wire everything up with George L's and Monster cable. Last but not least, I would like to stress that even though it looks like I use a lot of effects, I use them sparingly. It's still just fingers, steel, wood, and imagination!..." Listening to Rey's playing, what distinguishes him from the multitude of SRV wannabe's is his fundamental grasp of standard blues guitar. Counting Albert King, Freddie King and Hubert Sumlin among his influences, Rey really gets those Albert King semi-tone bends beyond simply mimicking SRV. Listen to "So Excited" on Rey's myspace site (click on photo or photo credit). "...If Stevie Ray were alive and ready to jam with you, what song would you choose? 'I would probably pick "Machine Gun" by Jimi Hendrix. Stevie never did it live, but I would love to do that song with him. The original still brings tears to my eyes. '... "
Anyone traveling to Tucson soon, for bidness or pleasure, oughta catch a Tightrope gig. This Strat-o-Brother is Certified Blues!